My race plan for this year meant that I would be racing Transvulcania the week after this years Hoka Highland Fling. I hadn’t worked this out when I booked my place on Transvulcania, so I was disappointed that I wouldn’t get to go back and run this wonderful race again this year. I remember sitting at home on the evening that the entries were opened, watching social media explode as hundreds of people booked their place. I didn’t want to miss out on the day because it is such a memorable event, so I contacted Johnny Fling to volunteer. A race of this magnitude takes a few hundred people to make it happen, most of them volunteers. I’ve helped out at my local club races on a few occasions, but this was the first big event I’ve helped on. I think everyone who takes part in these races should volunteer to help out once in a while. We all reap the benefits of the hours of time people give up for free, so it only feels fair to pay back or forward to the ultra running community. I contacted Johnny months ago and had actually forgotten about it until a couple of weeks before. 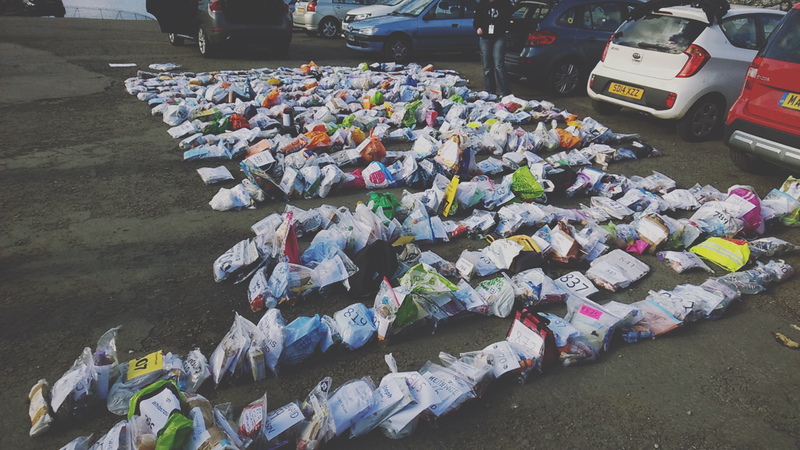 I spotted my name on the volunteer list against the Inversnaid checkpoint and because I’d noted that I had a car I was willing to use, I was to be at the start line to collect the drop bags for that checkpoint. Consequently, at 4am on Saturday morning I was in the car park at Milngavie train station a lot more relaxed than I was this time a year ago! After a race brief by Johnny from the roof of his Ding Ding transit van, the runners made their way over to the tunnel that marks the start of the West Highland Way. I admit that I was sad not to be lining up with everyone, but equally I was nervous for when I stand at the end of that underpass waiting for the start of the WHW race in 6 weeks time. 6 weeks! how the hell has that race come around so fast? More on the preparations for that in the next post. I managed to make it to the other end of the underpass before the first wave of runners were set off. This years race attracted an impressive bunch of runners who were all in with a chance of winning this race, so it was good to see these fast guys racing off up the steps at the start. Once these guys were on their way, the rest of the field were released and I headed to my car for the trip up to Inversnaid. The route there from Milngavie follows the A81 for a while and I recognised a section where the WHW crosses the road, so I pulled over to catch the race leaders as they came through. It was probably about 6 to 8 miles into the race, and when they came past, they all looked fresh and fast. After I’d seen a number of the front runners pass through this section, I was back in the car on off up the road to Inversnaid. The road to get to this place feels remote and weaves its way between some spectacular scenery. The weather was also amazing on Saturday, which was great for us spectators, but I did wonder how the sunshine would impact the runners if it were to hang around. I arrived at Inversnaid and wondered if I’d discovered the wrong place. I was the only person there except for a coach load of Lochs and Glens tourists. then I realised that it was still only 7:30am and people were due at 9am. Slowly other marshals for the day started to arrive as well as the other car with the rest of the drop bags and we all set to work sorting out 800 or more assorted zip lock, carrier, lunchbox, envelopes and other various forms of drop bag. It happened surprisingly quickly, neatly laid out in rows of 50. We then had a while to wait for the first runners to come through. While we were waiting a long haired, bearded guy appeared out of nowhere asking if he could expect to run into people racing if he was to run south on the WHW. We explained what was happening and in return he explained what he was up to. He had run Ben Nevis on Friday and his plan was the run the three peaks challenge, by running the whole route. He planned on reaching Scafell on Wednesday and completing the whole thing within two weeks. He then dropped into the conversation that he’d just run from Canada to Argentina before waving and setting off on his way. Ultra runners come in all sorts of shapes and sizes! Best of luck Jamie. Just after 10am the first runners appeared on the trail. That was 4hrs and a few minutes during which they have covered 34 miles and probably at least 1000m of elevation. That would be a great marathon time over that terrain, let alone for 34 miles. All of the leaders came into the checkpoint looking like they had only just started running and those who actually stopped to refuel, were in and out within a minute. The following twenty or so runners took a similar approach, in and out within seconds. Either simply picking up gels from a bag or a quick fill of a water bottle before dashing off again. It was a real insight into how the top guys deal with CP’s in these races. The subsequent wave of runners that came through were in a varying array of states. There were some who had paced themselves well and looked as if they were starting to climb the field, some who had set off too fast and were now starting to suffer and those who were just working hard to stay steady. The weather kept its promise to stay fine, the runners were all incredibly friendly, thankful, graceful and smiling. It was an incredible day and I’m so glad I volunteered to help. I have a renewed respect for everyone who runs in these races. From the fast guys at the front with their clinical focus on performance, through the next tier of amateurs who work incredibly hard to fill the 10-30% of the results table. Then the rest of the field who run these things to enjoy it, to meet new people, to experience things many people never experience and do so with a smile on their face. I hope next year I get a place in the race. I am keen to go back and see how much I’ve improved since my 11h 45m results last year. I suspect a lot, but it will be nice to see exactly how much a lot is. In the meantime, I will leap at the opportunity to help out again in this and other races. It is a wonderful experience and is just as good as taking part in the race as a competitor. Up next for me is the WHW race. I was scheduled to run Transvulcania, but now my work has produced something which means I can’t make it there for the race. IT’s a real shame as it looks like yet another amazing ultra race, but I’m looking forward to the WHW race now and that has my sole attention.